Bart and I are resting in Alabama after a truly humbling first day. We have received so much support and kindness in the last 24 hours that we feel spoiled (and very well-fed!). From the hospitality and hundreds of miles driven by Brad and Senetha for our hike, to meeting up with Mother Nature's Son and Blister Bob. . . wow! We had a great first mountain despite persistent fog! 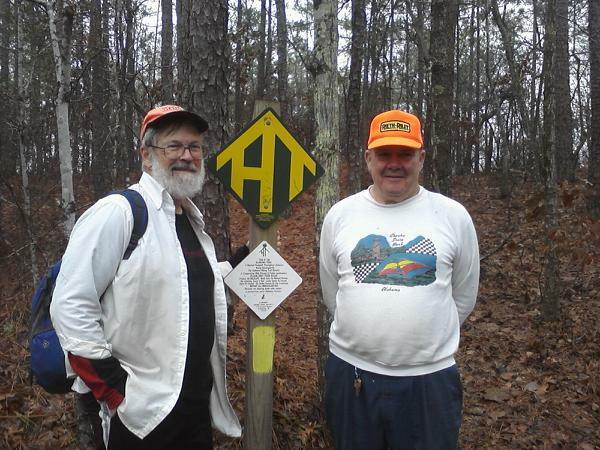 This picture, if my technology works, is of those two rockin' trail angels. Thank you for the shuttle, hike, guidance, company, water drop, and cookies! Our lunch break at Weogufka 2nd Baptist Church brought us an offer of showers and shelter, but we had plans to go about 7 more miles for a total of 13ish. We were adopted by Mama Dog for a mile but we think she was just escorting us through Weogufka. Part II of Trail Angel Day 1 coming soon.